The 1942-43 naval campaign against German U-boats known as the Battle of the Atlantic was a major victory not only for Allied warships but also for naval intelligence. Thanks to the coordinated efforts of submarine tracking rooms in London, Washington, and Ottawa, the antisubmarine forces' search-and-destroy missions helped preserve the safety of the seaways. Naval intelligence has been an aspect of World War II that has received scant attention. 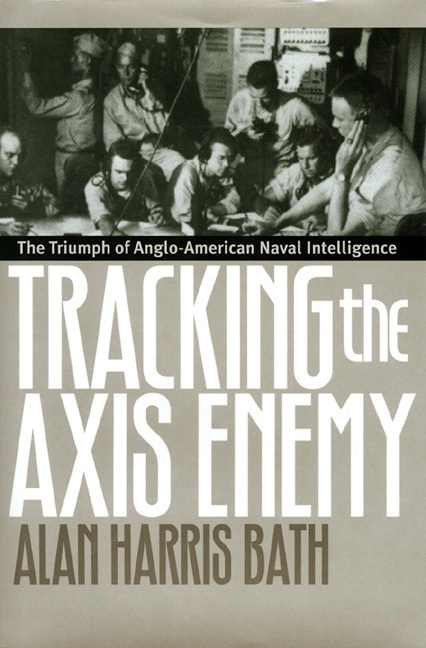 Now former naval intelligence officer Alan Harris Bath traces the coordination of Anglo-American efforts before and during the war, identifying the political, military, technological, and human factors that aided and sometimes hindered cooperation. He compares the two nations' different and often conflicting styles of intelligence gathering and reveals ways in which interagency and interservice rivalries complicated an already complex process. Drawing on archives in the U.S., U.K., and British Commonwealth, Bath describes h ow cooperation took place at all levels of decision-making, in all theaters of war, and at all points in the intelligence cycle, from gathering through analysis to dissemination. He tells how the U.S. learned from Britain's longer experience in the war and how intelligence cooperation was always subordinated to Anglo-American political relations-and how in the final months of fighting intelligence cooperation was impeded by the governments' post-war agendas. Although victory in the Atlantic was the capstone of this cooperative endeavor, Bath also describes how intelligence relationships fared in the South Pacific, not only between the forces of Admiral Nimitz and General MacArthur but also with those of Australia and New Zealand. Throughout the book, he emphasizes the contributions of Australian, New Zealand, and Canadian naval intelligence to this cooperative effort. As the first in-depth study of the nature, evolution, and impact of information sharing by Allied navies, Tracking the Axis Enemy is essential reading for historians and buffs alike. By showing how the Anglo-American political and cultural bonds shaped intelligence operations and how those operations shaped campaigns, it contributes a new perspective on the Allied victory. Alan Harris Bath served in the U.S. Navy from 1951 through 1983. His assignments included Commanding Officer, Fleet Intelligence Center, Europe and Atlantic; Deputy Director for Intelligence, U.S. European Command; and Commanding Officer, U.S. Naval Investigative Service, Pacific Area.